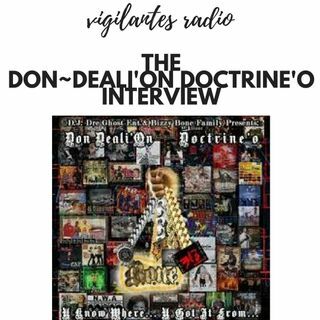 Don~Deali'On Doctrine'o stops by to chat with Dini Mussolini about his latest mixtape "U Know Where...U Got It From". Is he dissing some people, I have no clue but tune in to find out because we sure are going to ask him! Set your reminders, it's happening! Tonight 02/04/2017 | @10AM Central Standard Time | Call in at 701-801-9813 | or hop in the mix via browser by visiting www.onlyonemediagroup.com/vigilantesradio and slapping that "Go Live" button. Please ... See More follow our show at www.spreaker.com/onlyonemediagroup & remember sharing is caring! Thanks for your continuous support!